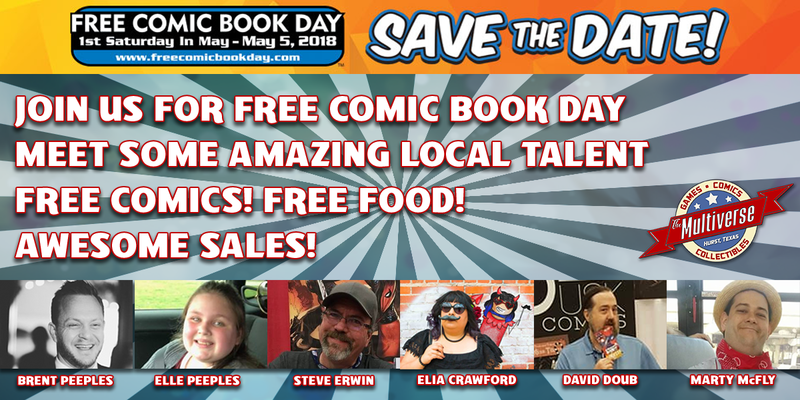 Free Comic Book Day is an amazing day for comic shops all across the country! It is a day where you can walk into a comic shop and get all sorts of sweet free stuff! In the case of the Multiverse, you’re going to get so much more than just a free comic. We will be grilling out in front of the store and having an insane sale on just about everything in the store! Meet some talented local folks! Brent Peeples (10am-afternoon) Elle Peeples (10am – afternoon) Steve Erwin (10am – noonish) Elia Crawford (10am – afternoon) David Doub (10am – ???) Marty McFly Dallas Cosplay (he is bound by no time!) Our doors will open at 10:00am on Saturday, May 5th, 2018. Stop by and say “hi” on your way in. Just for showing up you will get 7 FREE COMIC BOOKS! Bring a canned food item (with the label still on it) and we will give you 1 FREE COMIC BOOK! Come out dressed in a costume and we will give you 1 FREE COMIC BOOK! Check in with us on your social media the day of the event and we will give you 1 FREE COMIC BOOK! We have some Boy Scouts doing a fund raiser out front, too! If you support them, you’ll get 1 FREE COMIC BOOK! Buy One Get One Free Pops! 25%-70% off of just about everything else in the store!